The IOR is now taking bookings for its annual conference at Austin Court, Birmingham on the 12th June. 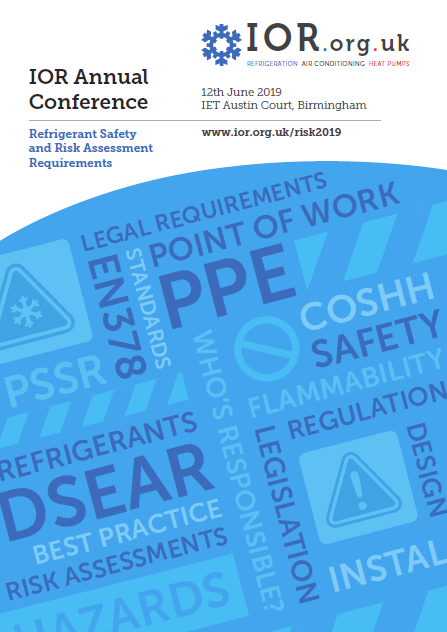 The event will explore refrigerant safety and the importance of risk assessment. Including understanding your legal responsibilities, who is accountable should an incident occur and how to comply with regulations. Speakers will discuss how the risk assessments process must be used continually, from design, through installation, service and maintenance and point of work. Case studies will be used to explain how if risk is not assessed at each stage it can lead to deadly outcomes but, if it is managed correctly, the process will protect both people and businesses. An early bird rate of £85 plus VAT is available to IOR members until the 18th May. To access the discounted rate members need to log into the website. This is a provisional programme and may be subject to change.